The BJP and its allies are in control of 22 states in India. This is a staggering proposition to boast vis-à-vis the Congress, notwithstanding the recent setbacks in assembly elections. Though the BJP’s tally has risen in the Rajya Sabha, its strength in the Lok Sabha has gradually declined from a little over simple majority in 2014 irrespective of the collective strength of the National Democratic Alliance it leads. There are two interesting and interrelated developments taking place in Indian politics and the party system in India. While the Congress has been waging a stiff battle to preserve its identity as a national party with its sparse presence, the BJP has been digging its heels to project itself as a national party with electoral success spread across the country, from west to north, and to the Northeast. These two parties want to confine national politics to a bipolar contest by bypassing the stark reality of strong regional currents, parties, leaders and aspirations. There is a yawning gap in terms of the BJP’s projection and its presence despite aggressive manoeuvres to gain a foothold in the south. The BJP’s growth in the south has essentially been less than political as its attempts to reduce religion to political sentiments and Hindus to a votebank have never appealed to the electorate in south. In Karnataka, it had made certain early inroads when the anti-BJP vote was vertically split between the Congress and the JD(S). When the two parties joined hands, the BJP found it difficult to surpass their combined voteshare. The BJP’s attempts to reduce ­religion to political sentiments have never appealed to the ­electorate in the south. The BJP is unlikely to make any major gain in the south despite its growing visibility, owing to its image as “Hindu, Hindi and Brahminical fascist” as well as the emergence and collusion of highly influential business houses and private-corporate capitalists. The BJP is unable to comprehend the fact that the essence of government does not reside in coercion. Traditionally, southern voters are more sensitive towards issues of excessive centralisation and weakening of the rights of states. While the Congress has increasingly been adopting soft Hindutva as a way of appeasing the Hindu electorate, the BJP has chosen to consolidate caste votes with promises of greater stakes for the middle and marginalised castes and communities. It anticipates dividends from the 10 per cent reservation on economic grounds regardless of caste, but that move could prove counterproductive in the southern states, particularly Tamil Nadu. In Kerala, where the BJP tried to make political capital out of the Sabarimala issue and unite the Hindus, what it does not understand is that the people will not vote in a government rooted in one religious identity. In fact, the Left Democratic Front (LDF) and its cadres are more organised today than a few months ago, having been woken up from their complacency after the Sabarimala verdict. The LDF will not deliver the state on a platter as the Congress did with its appeasement over Ayodhya. The Congress virtually surrendered to the religious currents and suffers from a prisoner’s dilemma. The BJP has even more worries in Karnataka bec­ause of the urgency to preserve and improve its voteshare and seats tally than elsewhere in the south. Issues like corruption, political manoeuvres and poor leadership don’t separate the BJP from other parties like the Congress and JD(S). But the waning of the Modi effect and his semi-monarchist handling of the economy as well as excessive centralisation could see the wind blowing in favour of the Congress-JD(S)—unless the two partners undermine each other in seat sharing and ticket distribution. In Telangana and Andhra Pradesh, both the Con­gress and the BJP are at sea. Though the Tela­n­gana Rashtra Samithi is often seen as the BJP’s ‘B-team’, CM K. Chandrashekar Rao is unlikely to yield to a pre-poll truck with the BJP for fear of losing Muslim votes. In Andhra, the Congress and the TDP could be weakened with the emergence of Y.S. Jaganmohan Reddy and Pawan Kalyan as influential players. In both the states, the BJP will neither be able to stay afloat without an ally nor can it force an alliance like in Tamil Nadu, where it now wants to make the most out of the callous corruption and transitional instability under way in the DMK and the AIADMK. 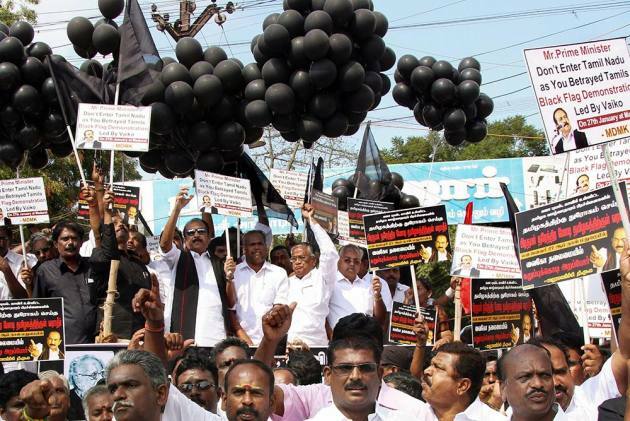 But the Tamils do not see the BJP as an alternative to either regional party. This leaves the DMK and its allies better placed than others in Tamil Nadu. 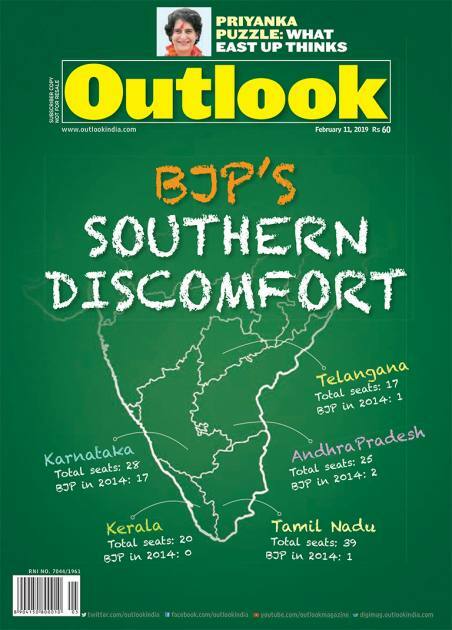 Overall, reluctance towards the BJP will prevail in the south this time as well.